The Amazing Super Absorbent Micro Fibre Towel. This is no ordinary towel! A revolution in dramatically reducing drying times for any animal large or small. Absorbs moisture four times quicker than a standard towel. Perfect for dogs to walk on with wet muddy paws! Hollow woven micro-fibre (80% polyester/ 20% cotton) has four times the surface area of a standard towel. 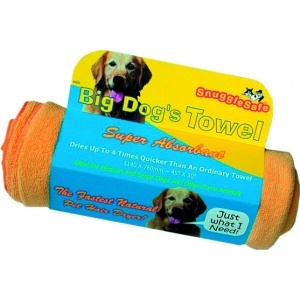 This drives moisture out of pet hair into the towel. Split ends and hair fuzziness is dramatically reduced. Just wrap towel around pet no need to buff animal down. Machine washable at 30ºC or hand wash. Because micro fibre is lightweight you can get fours times the wash load than a regular towels. Perfect for groomers the car or even the kitchen back door to mop up wet muddy paws.